TWO Gweru police officers who suffered broken limbs after being hit by a commuter omnibus as they attempted to stop the driver, are battling for life. Acting Midlands provincial police spokesperson Assistant Inspector Ethel Mukwende referred questions to National police spokesman Assistant Commissioner Paul Nyathi who however, said he was yet to get details on the matter. Police sources however said the incident that left Constables Godwell Chikamba and Logistic Muzuve injured occurred last Thursday at around 4PM at the intersection of Eighth Street and Leopold Takawira Street in Gweru. “The two police officers who were in uniform were patrolling around the CBD when they saw a commuter omnibus- a Toyota Hiace- which was at the intersection of Eighth Street and Leopold Takawira Street. The police officers suspected that the three occupants including the driver were smoking dagga,” said the source. He said the police officers allegedly waved down the commuter omnibus but the driver did not stop. 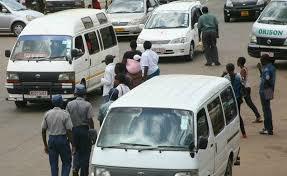 “The Kombi ran over the two police officers who as a result sustained broken limbs,” said the source. After realising that he had injured the two police officers, the source said, the commuter omnibus driver who is still to be identified, dumped the vehicle and fled from the scene.